Website Development in Fairfield County and N.Y.C. Web Development is a mix between Web Design and Software Development. For example, a basic website that displays static information like “our services”, “about us” and “contact us” is almost purely web design and requires little to no development. A multilingual website that allows customers to pay their bills online by using real-time accounting data or a custom shopping cart requires web development. Although more costly than straight web design, web development does have a high return on investment if your organization can replace repetitive menial tasks done by hand. For example, a common business need is e-commerce. If your business sells precision, hand crafted, luxury widgets then a standard off-the-shelf shopping cart would most likely do very nicely. However, if your company is a parts distributor selling thousands of stocked items with low inventory, having Harrison Consulting, Inc. develop your e-commerce site a better solution. This type of solution would securely integrate your accounting software with your custom e-commerce package and, in real-time, run credit limit checks, give quantity pricing, display product availability, apply contracted customer discounts, determine shipping costs and estimated arrival dates. Web Development isn’t limited to just e-commerce. 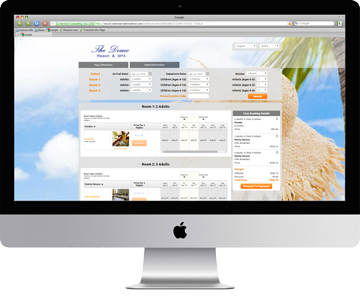 WebReservationsDirect.Com is an example of a simple idea, an affordable online hotel reservation system, which has evolved into an entire division. 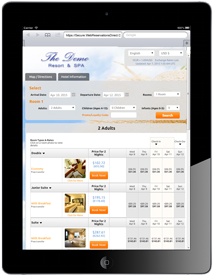 WebReservationsDirect.Com was introduced in early 2015 as a hotel reservation system that easily integrates into a hotel’s website. Instead of following the classic commission based revenue model, WebReservationsDirect.Com works by charging a transaction fee for every completed reservation. Our site supports 9 languages, 55 currencies and serves hundreds hotels throughout Greece and Cyprus and has expanded to the USA, UK, and Ireland. Harrison Consulting, Inc. specializes in developing solutions tailored to your business needs. If you would like to see your idea become a reality, please don’t hesitate to contact us.